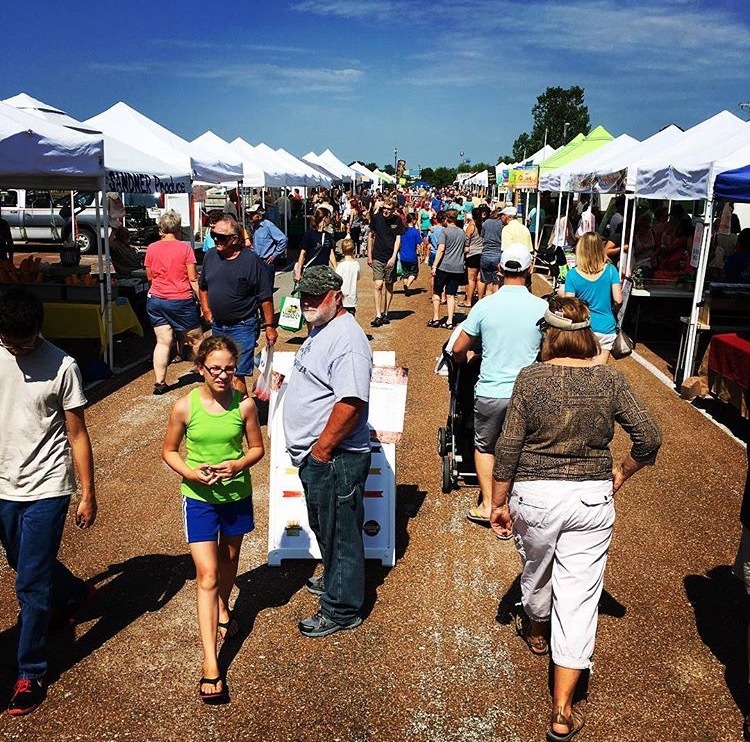 This week, our Instagram take-over is brought to you by Columbia Farmers Market in Columbia, Missouri. We’re inspired already by the educational programming they have for kids (and innovate way they fund some of these programs!) as well as their efficient methods for verifying vendors. We think you will be too. Read the details below from our interview with CFM’s market manager Corrina Smith, and head on over to Instagram to follow their story! Corrina Smith: The Columbia Farmers Market started operating in 1980, when a group of local farmers came together to sell in one location rather than parking lots around town. With the exception of 3 years, the Saturday market has remained in the same location, a parking lot behind Columbia’s Activity and Recreation Center (ARC). The market has experimented with different weekday markets through the years, and currently operates a Wednesday and Thursday market during the height of the summer. The market just finished up it’s 7th year operating a Winter Market, which has seen substantial growth in vendors and customers each year. CFM is ran by one full time Market Manager and four part staff that mainly work on Saturdays. The market is a membership, meaning that all vendors that sell, pay a set fee each year to vend at the markets, elect a Board of Directors and vote on rule changes. The Board of Directors oversees the staff, which is made up of seven volunteer members. CFM is a producer-only market, being one of largest in the state of Missouri. It has 80 members, featuring a wide range of products from fruits and vegetables, meats, dairy, baked and canned goods, artisan products, plants and more. All members must grow, raise or produce their goods within a 50 mile radius of our market. CFM inspects all of its farms to ensure that are customers are receiving the highest local quality products available in our region. The market moves indoors to a renovated shopping center during the months of November through March. Around 40 vendors sell and an average of 500 customers each week. Weekday markets take place May-October, one being in the same location as the Saturday market and the other on the South part of Columbia. Our summer market operates in a parking lot, with two long rows of vendors all under pop-up tents. At the height of the season we see around 3000 customers at market. We have live music and children’s activities each week. FMC: What do you do to generate excitement for your market? CS: Funded through our sister organization, Sustainable Farms and Communities, we offer a weekly $25 match for families that have children under the age of 19 that receive SNAP or WIC benefits. In 2015 we matched $23,804! The program has seen substantial growth each year, and recently secured a large grant to continue the program into the future. Starting in 2014, CFM started offering educational activities for kid’s at market. CFM created a booth, called The Greenhouse, where they partner with different community organizations and schools to bring interactive and educational programming for kids at market. In 2015 CFM started a children’s club called The Good Food Detectives. Kids come to market and sign up to be part of the club and receive an activity booklet. Each activity focuses on different aspects of supporting local farmers and eating healthy. For each completed activity the kids receive “Munch Money” that they can purchase food with at market. Since the start of the club in September of 2015, there are over 100 kids signed up for the club. The Greenhouse and the Good Food Detectives club were funded through a Specialty Crops Block Grant. To fund the “Munch Money” portion of the program, the market holds an annual Farm to Table dinner. The dinner features donated food from the market, accompanied by local wine and beer. Local chefs prepare the 6 to 8 course meal feeding 100 market supporters, all taking place at the beautiful Blue Bell Farm event center. CS: Our market has experimented with a variety of advertising platforms throughout the years. We have found that the best “bang for our buck” is through heavy social media pushes (Facebook, Twitter, Instagram) when we need to get the word out. We do a limited amount of television and radio ads at the beginning of each season. The most important thing is to send a consistent message through all of your avenues, whatever those may be. FMC: What are some of CFM’s challenges and successes? CS: As a producer-only market we only allow vendors that grow, raise or produce their goods. It’s been a challenge over the years to make sure that all 80 of our vendors are following our guidelines. To help ensure that all of our farms and businesses are inspected we began to hold an annual Inspect-a-thon where volunteers inspect groups of farms in one day. The Board and Market Manager inspect new members before they can sell at market. Each week we take photos of vendors’ booths to keep a record of their products in case any issue were ever to arise. Another challenge we face is retaining our customers during the winter months. We move to a location on the other side of town and loose over 50% of our customer base. During the summer market, we are located in the middle of a large field and deal with Mother Nature more than we’d like! It tends to always be windy and rains often. CFM hopes to build a shelter in the near future that will house the market year-round, fixing both of these challenges.